planetf1.com • View topic - Will This Year's Cars Be Faster Than 2018's? Will This Year's Cars Be Faster Than 2018's? Which Year's Cars Will Set Faster Times? Post subject: Will This Year's Cars Be Faster Than 2018's? Considering the fact that the new regulations will simplify aerodynamics and take away downforce, do you anticipate the lap times being slower this year or do you think that the additional year of development of the other areas of the car (including PU) will lead to faster times? It's hard to say at this point but my gut tells me the cars will still take a step forward in pace. Could be wrong though. Post subject: Re: Will This Year's Cars Be Faster Than 2018's? At Australia, or at Abu Dhabi? I think they'll be a little bit down on last year's times in the beginning, but they'll do what they do best and claw all that time back by the end of the calendar. That's an interesting read. 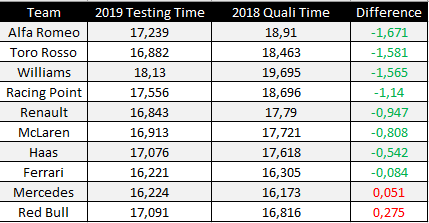 I actually think it might be that they are quicker at places like Monza and Montreal but slower at places like Monaco and Barcelona. Pretty decisive information there. The cars are definitely faster. And the top three have really held back in testing. Indeed; not to mention the fact that the cars were supposed to have lost downforce. So a track like Barcelona should be one where they would particularly lose out. At someplace like Monza they will likely be ridiculously fast.